Flat roof windows allow you to fill a room with light. With a variety of opening options and styles, you’re certain to find the ideal flat roof window for your property at Roofing Megastore. 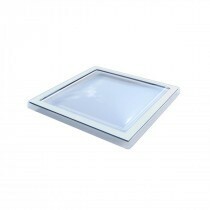 Choose from our affordable Mardome roof lights or stylish Fakro flat roof windows. Both of these manufacturers are renowned for crafting high quality roof windows in a variety of styles. Our flat roof window selection have all been created with light, reliability, ease of use and strength in mind. Each are easily able to withstand heavy rain and hail, as well withstand UV radiation. This is achieved through a special coating used on the majority of Mardome and Fakro roof windows. For areas where footfall is possible, we offer a selection of flat roof windows that can be walked on. Some of our products also feature an anti-slip pane that can be walked across in its entirety. 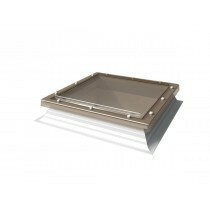 These skylights are particular ideal for schools or other public facilities. 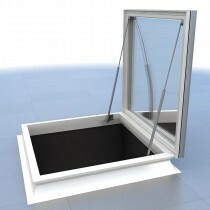 Each of our flat roof windows are available in a range of sizes. This ensures you can find the right product whatever the size of your roof space. We have choices to suit single ply, bituminous, metal and liquid applied flat roofs contained in our selection. Our flat roof windows can also be found in various finishes, such as bronze, opal, textured and clear- allowing you to get the perfect style for your property. When used in conjunction with a compatible kerb edge or beautifully designed builder’s upstand, they provide a professional appearance on any property. If you’re in search of extra security, take a look at our Anti-Burglary P2A double glazed unit from Fakro. 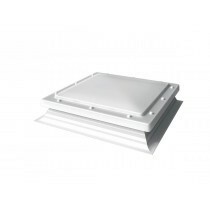 Alternatively, consider the Mardome Ultra roof lights with tamper-proof security fixings. These feature reinforced glazing as well as specially developed locking mechanisms. This superior security provides confidence for those installing a flat roof window on their home and added protection to those fitting a skylight on a public facility. You really needn’t worry about the security of your home or office with these stunning windows. Roofing Megastore also offer a range of access and escape hatches. These allow you to gain access to your roof for maintenance or other purposes. It is for this reason that they are great for roof terraces or roof gardens. 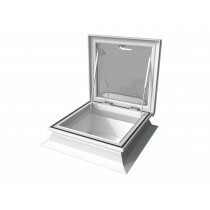 These skylights are ideal for those who require an escape hatch too. This is due to them being easily opened from the inside and, for some windows, remaining open with ease. In public buildings where fire safety is of the utmost importance, these escape hatches overcome a handful of potential issues. Have Questions About Our Flat Roof Windows? If you have questions about our roof windows, speak to our team by telephone or via the online live chat. With over 40 years experience in roofing, we’ll help answer your questions about windows for flat roofs. We will also help you pick the necessary fixings and flashings for your project. Buying roofing materials can be daunting, especially when ordering them online. With over 40 years of experience in roofing, however, we get asked lots of questions about our growing range of skylights. Here are some of the most common questions with answers for each! Which Brand of Flat Roof Windows is Best - Mardome or Fakro? Roofing Megastore supply both Mardome and Fakro skylights. Both brands are recognised for manufacturing high-quality options and also craft windows to match almost any taste. Unlike Fakro, Mardome offer low-cost flat roof windows as well as premium alternatives. Can I Fit a Skylight on a Pitched Roof? Flat roof windows are typically only suitable on roofs with virtually no pitch. Therefore, we recommend that you consider our range of pitched roof windows if your roof has a pitch above a couple of degrees. If you have more questions about our roof windows, speak to our team online or by telephone. With over 40 years of experience in roofing, we’ll help answer your questions about flat roof windows and will ensure you have everything you’ll need to complete your roofing project.